During my 3 week stay in Bali I made it to my mission to find the best places to go and eat out. I created a selection of some of my favorite places that I´m happy to share with you within this article. I hope you will enjoy the food cravings and have the chance to discover some of those places when traveling to Bali..
One of the first restaurants that I visited in Bali was Kilo. 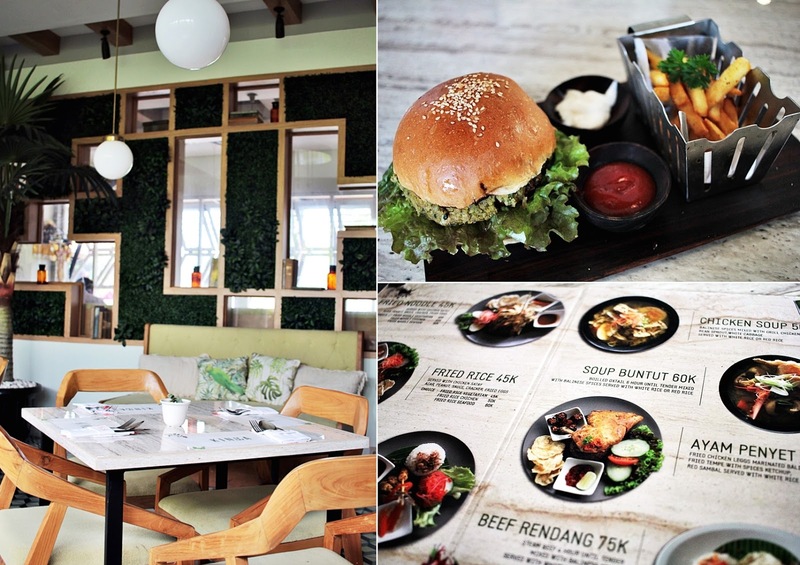 Kilo Bali is an adorable place which is more like an oasis out of the city. While the restaurant is located next to the main street in Seminyak, one will find a stunning location at Kilo and very artistic cuisine. Kilo already opened in September 2014 and became a secret hotspot. Kilo uses local ingredients and produce. While I was trying three different dishes I got an imagination of how tasty the food is. If one eats out at kilo one will experience “the art of spice”, as I call it. The special ingredients at Kilo are all the spices coming together to one intensive flavour. Most of the dishes are based on meat and sea food, so options for vegans are rare. Vegetarian options are still available. My favorite and high recommendation for Kilo is the basil ice cream, seriously one of the best things I EVER had. Kilo opens for brunch and dinner and also features a cocktail bar, which is a wonderful place to go with friends in the evening and just enjoy yourself and the nice beats, as there are also DJ´s. The interior and design are already amazing, but if one looks on the place one will just find all the art and creativity, that is also visible throughout the design of the restaurant space. Close to Seminyak there is also a recently opened restaurant named Hibiscus. 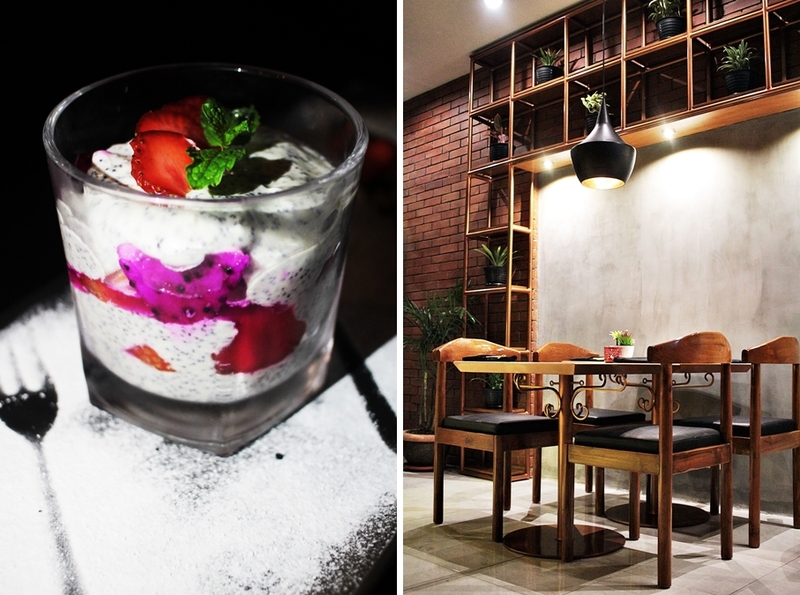 Hibiscus is a very centered place with a total of two floors and an outdoor area. Something special about this restaurant is the fresh food and the delicious drinks. One will have the selection out of a “healthy drink menu”, which is worth a try. The team is very kind and supportive and offers also customized meals for special diet requests. My favorite was the ratatouille burger, which is out of the breakfast menu but still suitable for lunch or dinner. A special side dish are the homemade fries, which are more country style. I really enjoyed my visit at Hibiscus and returned during my stay in Bali. 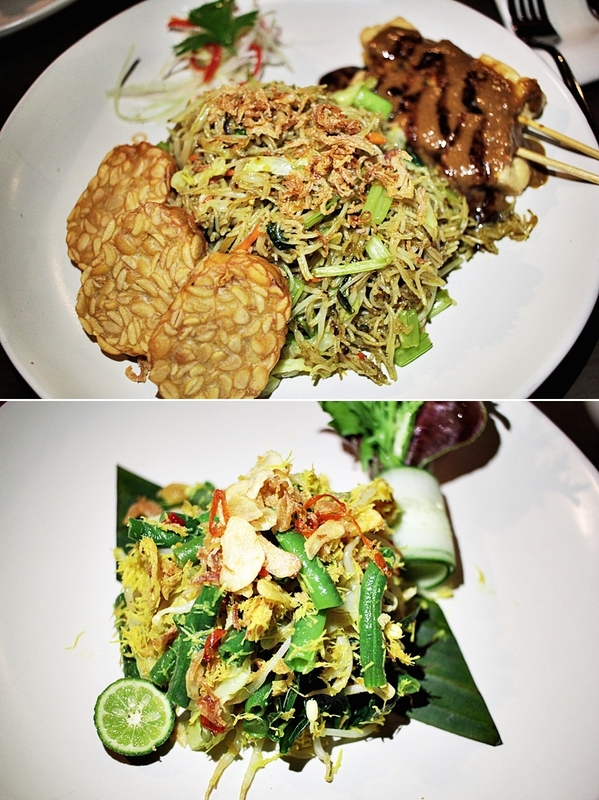 All the food is made of local produce and features international fusion with Indonesian Indonesian authentic atmosphere. A wonderful place to go out for lunch is Le Patio. Le Patio features a Garden and a selection of fresh drinks, including young coconuts. While it covers many snacks and starters I highly recommend trying the nachos and guacamole, truly delicious and almost ever sold out. The menu features all kind of food and gives also a selection on tofu. The kitchen is open and connected to a bar. One can easily take a quick look on the final food preparation, which is fun to watch. The service is quick and very kind and the prices are affordable. It has a nice lounge atmosphere in the night, especially with the garden area in the back people feel very cozy. Some of the signature dishes are fresh noodle dishes and pizza. I really enjoyed my time at Le Patio Bali. It is perfect for people running through Seminyak all day and a good place to have a break in between the day or for a cool down after a long day in the city. If you are looking for a completely vegan place Earth Café is your best choice. 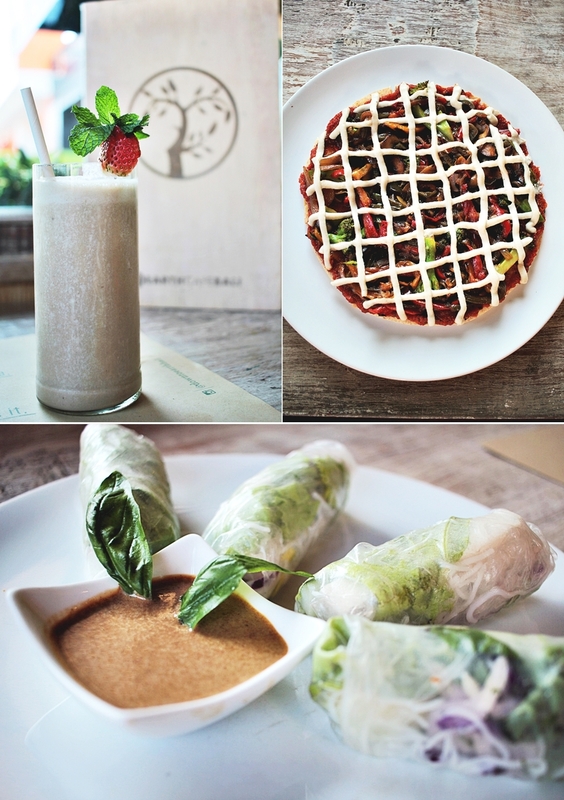 I loved this place and can´t wait for their vegan festival in October in Ubud (6th-8th October). Earth Café shares the vegan passion and is always fully packed. They also serve fresh coconuts and vegan meat selections, so as seitan and tofu. Also, the drinks are a must do, especially the smoothies or healthy shots are worth it. I really enjoyed the Asian inspiration, but also international kitchen is features. It doesn´t matter if you want to head out for a pizza, burger or sushi – they have it all. The food is all fresh and the team is nice and supportive. I felt very cozy and there is also free WIFI. Earth Café is located on the main road in Seminyak and worth the stop, trust me. They also have a shop for beauty and foods to take away. All organic, of course. If you ever make it to Canggu, please make sure to not miss the adorable Kinuwa restaurant. Located in a square one will find the café and restaurant, that features many vegan dishes and smoothie bowls. Especially for breakfast this restaurant is very busy. The design is all while and clean. Marble is visible everywhere and it´s a picture-perfect place. Also, the food is picture perfect and tastes heavenly. I had the falafel burger for the main, which was amazing. Also, quinoa dishes are offered and the chia smoothie bowl is something that I definably want to prepare myself back home. I loved the design of the restaurant and felt super comfortable. It´s also a greet working space and features an amazing design. It is only a 15-minute walk down to the beach, which might be a great fit for one´s plans before or after the visit. I spent an entire day at the Anvaya Beach resort and discovered both, lunch and dinner. For lunch, I went to the Sands restaurant, which features a more western inspired menu, combined with Asian influences. The Sands restaurant is next to the beach and offers breathtaking views. One will be surrounded by a quiet beach which feels like a private escape. Also, the views on the plate are pretty fancy. The food was extremely delicious and vegan, so as gluten free options are given. Sands is an all dining location with an open kitchen. Especially the noodles are a high recommendation. If you should feel like more into discover something new, one will also have the chance to cook with the skilled chefs. Also, Sands offers events and special parties with DJ hosts. Sands is definitely a place to go if you look forward a fine dining experience with a reasonable pricing. My favorite was the fresh Dim Sum. Make sure to stop by the Kunyit restaurant as well. It´s the Balinese inspired restaurant of the Anvaya resort and features Balinese cuisine with many vegetarian and vegan options. Also, the Kunyit restaurant features an open kitchen. Something very special is that the waiters will come over to the tables as wash your hands. It´s a little ceremony that every guest will experience. Also, there is a weekly Balinese dance performance at Kunyit. One will be able to enjoy the Balinese dance while having dinner. The show is free for everyone who orders a meal.